Fresh off their Fall tour with The Kooks, Tuesday December 6th, 2011 -The Postelles play the Bootleg Theater in Los Angeles California. 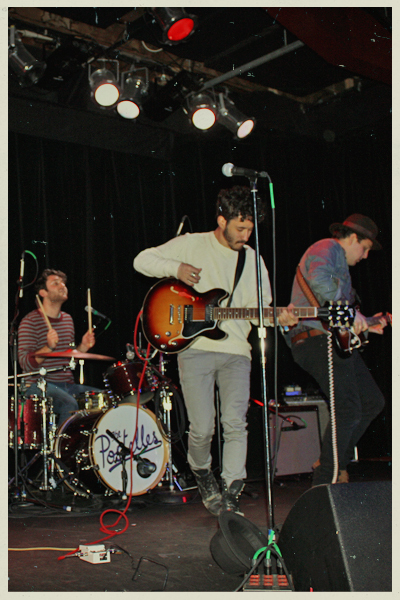 Earlier this year, FYM had the pleasure of seeing The Postelles in action on tour with Free Energy at The Crocodile in Seattle Washington, USA. 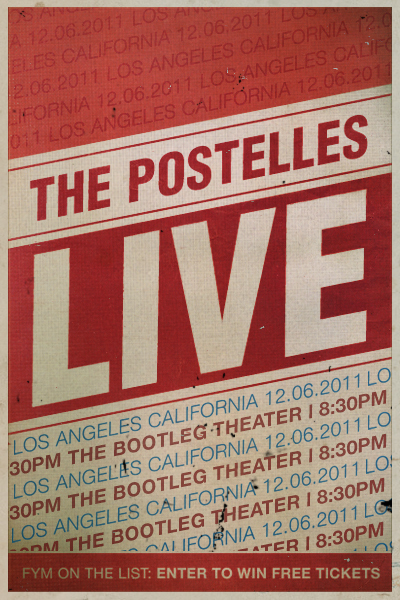 #BlackFridayBonus -We have a pair of tickets for The Postelles December 6th show in L.A. live at the Bootleg Theater! FYM wants to send you and a nighttiming partner of your choice to the show for FREE. Enter to win by simply emailing our publicist Nick November Rain Codling HERE before Sunday December 4th, 2011 with THEY LIVE in the subject line. We will notify the lucky winner 12.04.11 8p.m. PST. For more jams and info visit The Postelles website HERE. Cheers, FYM. I have just discovered The Postelles. They remind me a tiny bit of The Strokes, and that probably has to do with Albert Hammond Jr.'s influence on the record. Nice observation Kristi, definitely in a similar ballpark of sound with The Kooks and The Strokes- The Postelles are an amazing band to see live! They are awesome live! No pretension, no condescension, no BS, just flat fun-groovy tunes. All they want is for you to dance a bit.